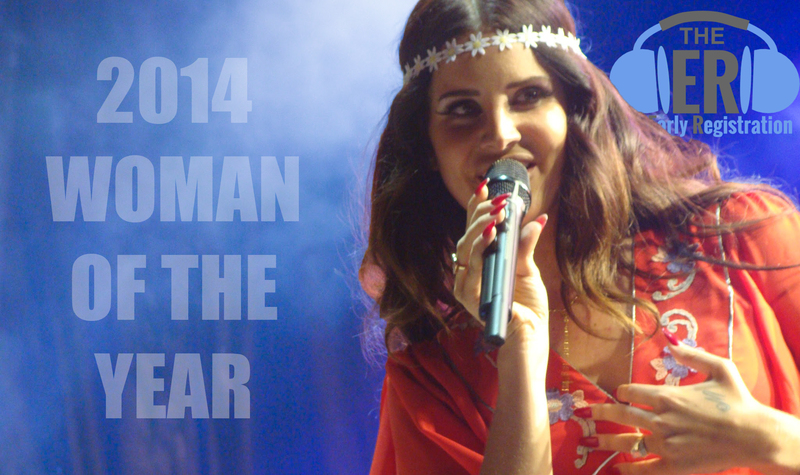 It is hard to imagine what woman (or man) in music had a better year than our 2014 Woman of the Year, Lana Del Rey. In just a year’s time Lana has continued her way to the top by touring the world, recording tracks for some of your favorite directors, putting out her best and most critically acclaimed album to date and picking up a number of award nominations on the way. Lana’s amazing 2014 kicked off in March as she announced her biggest North American tour to date. The tour kicked off in Las Vegas on April 11th, made its way throughout the U.S. and Canada, and ended in Seattle on May 27th. However Lana did not stick to just touring during this period, as the singer released the lead single for her third studio album Ultraviolence, ‘West Coast’, on April 14th (with its video released the next month). The Dan Auerbach (the Black Keyes) produced song was an instant favorite of fans and many fans got to hear the song live on her 2014 tour. Not even three weeks after the end of her tour, Lana released Ultraviolence on June 13th, which was instantly received with critical acclaim. Since its release, the album has received a number of great reviews and found its way at the top of many year end lists. Rolling Stone named the album #7 of their Best Albums of 2014, #4 for female artists. Slant, Time, and Complex also put the album in their top ten, naming Ultraviolence the third, sixth, and third best album of 2014 respectively. Two track’s from Ultraviolence also found their way on our Top 30 Tracks of 2014 list, while we named Ultraviolence our Best Album of 2014. Despite its wide critical acclaim however, the album was noticeably snubbed by the 57th Annual Grammy Award nominations, to the disbelief of many. While the Grammys did not nominate Lana Del Rey for an award for their 57th annual award show, Lana did receive two nominations for the 56th annual award show, which were presented earlier this year. Lana received two nominations, one for her Great Gatsby track ‘Young and Beautiful’ for the Best Song Written for Visual Media and one for her second studio album Born to Die: Paradise Edition for Best Pop Vocal Album. The Grammys were not the only ones to recognize Lana’s music this year, as Lana Del Rey continued to provide her talents for movie scores, this time for director Tim Burton and his film Big Eyes. Lana’s 2014 track of the same name was recently nominated for the 72nd Golden Globes Best Original Song award. One would think after her biggest North American tour to date, there would not be time to perform live elsewhere or plan another tour… Not the case for Lana. After her successful summer, Lana performed in front of many of her idols, in a cemetery of all places. In October, Lana performed back-to-back nights at the Hollywood Forever Cemetery, now home to some of music’s most talented whom have passed. Just over a month later, Lana announced her 2015 Endless Summer tour, where she will be accompanied the polarizing but legendary alternative rock singer Courtney Love. Despite the award snubs, and even a lyrical threat from Eminem, Lana blocked out the negative and had herself one hell of a year, and probably her best year yet. Sure, Taylor Swift sold millions of records and St. Vincent put out an amazing album as well, but top-to-bottom, January-to-December, and despite the other female artists who had a great 2014, no one had a year in music quite like Lana Del Rey. Don’t expect her to slow down in 2015 either, as Lana is already working on her next studio album. Looking back on this New Year’s Eve day, many had a great year, but there is no better choice for our 2014 Woman of the Year than the iconic and immensely talented Lana Del Rey.